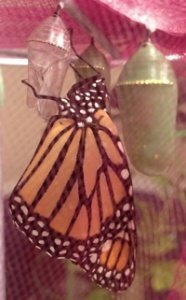 We are experiencing the Life Cycle of the Monarch Butterfly in the 5-Day Class right now. Right before school started a female Monarch flew through Mrs. McGowan’s backyard and laid 10 eggs on her milkweed. 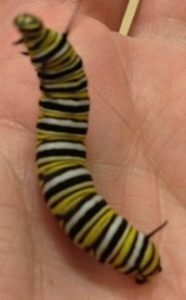 The children have seen the tiny egg, a newly hatched caterpillar and have seen how the caterpillar eats and eats and grows and grows. When it is finished growing it climbs to the highest point and makes a silk button from which it hangs. It then forms a J while it is getting ready to change. It does a pupa dance and sheds for the last time and forms a beautiful green chrysalis with gold dots. We are keeping an eye on our chrysalises and check every day to see if our butterflies have eclipsed. We have learned new words like: chrysalis, milkweed, pupa, cremaster, eclose , migrate and hibernate. We have read many books about Monarchs and how important they are in our world. We learned that the Monarch has a long, long journey in the Fall. 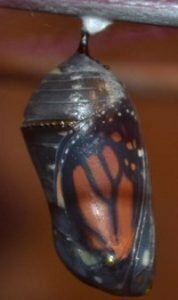 The Monarch travels over 2000 miles to Mexico to hibernate during the winter and then when the spring comes they start to migrate back north and follow the milkweed as it grows. When our butterflies are ready, we will release them for their long journey. We have also been doing an author study. We are reading many books written by Mo Willems. He has written Knuffle Bunny, Knuffle Bunny Too and Knuffle Bunny Free. These are about a little girl, Trixie, and her favorite stuffed bunny. In each book Trixie is a little older and slowly outgrows her bunny in her own time. Mo Willems also wrote the Pigeon books which the children cannot get enough of. They are quite funny because of the pigeon’s dramatic nature and every book has the children laughing and wanting to read another right away. Another series he has written are the Piggy and Gerald books. These are great for beginning readers as they have many sight words, repeated phrases and words easily sounded out. We are also busy making new friends in our classroom. We have children from many different classes and even some brand new students. We are learning each other’s names and how fun it is to play with new friends. It is great to see them connect with new friends.